During the first two years in the EVS p rogram, students are immediately immersed into the interdisciplinary nature of environmental science through introductory coursework. Sustaining a Planet (UGS 303) is an introductory course in sustainability co-taught by Dr. Jay Banner (Department of Geological Sciences) and Dr. David Allen (Department of Chemical Engineering). Sustaining a Planet provides students with an engaging overview of what environmental science and sustainability actually mean. The course examines sustainability from the integrated perspectives of how the natural world works and how the engineered world works. The course progresses from how the Earth and its environment operate on local and global scales due to natural and man-made processes, to how science, technology, economics, the media, and social policy are interrelated and affect individuals, communities, and nations. The human dimensions of rapid climate change, water resources, food, energy, waste and biodiversity are examined from multiple perspectives. Students in Sustaining a Planet complete a portfolio of their work throughout the semester, and are required to engage in a form of environmental action as part of that portfolio, such as self-guided field exercises to local organic farms or working with campus operations staff to apply sustainability principles to housing and food service operations. Sound science rests at the foundation of the EVS degree program. Therefore, within their first two years in the program, all EVS students take a year of biology and chemistry, along with additional studies in physics, ecology, geology, and calculus. Calculus: An introduction to the theory and applications of differential and integral calculus of functions of one variable; topics include limits, continuity, differentiation, the mean value theorem and its applications, integration, and transcendental functions. Introductory Biology I & II: An introduction to biological energy transformation, cell structure and physiology, gene expression, mechanisms of inheritance, evolution, physiology, and species interactions. Principles of Chemistry I & II: An introduction to the principles of chemistry, along with the development and application of concepts, theories, and laws underlying chemistry. Introduction to Physical Geology: The study of the mineral and rock composition of the earth, measurement of geologic time, origin and evolution of life, earth’s interior, plate tectonics, and ancient climates. Calculus-Based Physics: An introduction to general, mechanical, or engineering physics, including mechanics, heat, sound, and the primarily laws of motion. Landscape Ecology: The study of spatial patterns in the earth’s biosphere found within landscapes, typically areas measured in square kilometers, and examination of the processes that create those patterns, drawing from ecology, biogeography, and many other disciplines. Hydrogeology: Introduction to the basic concepts of fluid flow, surface and subsurface hydrology, aqueous geochemistry, and fluid-rock interaction. Additional topics include isotope hydrogeology, evolution of seawater, and mineral-solution equilibrium. Ecology & Ecology Lab: An introduction to the study of relationships among organisms and between organisms and their environment; adaptations, population, communities, and ecosystems. Includes intensive field ecology. EVS students engage in interdisciplinary, thematic study during their first two years, drawing attention to some of the more political and practical issues surrounding environmental science. Environmental Policy: EVS students engage in policy and perspective in Environmental Ethics, Conservation, Resources, National Parks & Protected Areas, Political Ecology, or Sustainable Development. Geographic Information Systems: EVS students learn about geographic information systems in Geographic Information Systems, Environmental Geographic Systems, or Introduction to Remote Sensing. 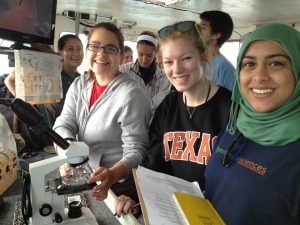 Climates & Oceans: EVS students delve into the deep with Marine Ecology, Marine Environmental Science, Biological Oceanography, Exploration & Exploitation of the Sea, Limnology, Physical Climatology, or Climate Change. Environmental Economics: EVS students learn about the economic side of the environmental equation in Environmental Resources & Economic Growth, Introduction to Micro-Economics, or Marketing Seminars.